Although it legalized gambling was a part of the early formation of North Carolina, by 1764 gambling was deemed illegal. A law was enacted to limit personal winnings, to curtail the thirst for a game of chance. But gambling continued to blossom forth like a sweet magnolia tree. Colonial legislators believed that gambling stood in the way of a healthy life and the value of hard work was minimized by games of chance. To further combat the negative effects of gambling more legislative steps were taken to ban public gaming tables (1791), staked card games in public taverns (1799), lotteries (1834), private gaming tables and slots (1835) and slot machines (1939). Aside from the casinos run by the Eastern Band of Cherokee Indians, bingo and licensed raffles were the only games of chance permitted by North Carolina law. North Carolinians would pay visits to bordering states to get their game on, but had little available to them on the home front. Proponents of gaming argued that this movement by gamblers across state lines in order to play was robbing the state of much needed tax revenue. Contrary to efforts put forth by state and local law enforcement illegal sports gambling, video poker, off-track betting and other forms of wagering continued. If you’re in The Old North State, an account from one of the offshore real money US poker sites is possible; you just have to know where to look. 2 Can Players from North Carolina Play Poker Online? 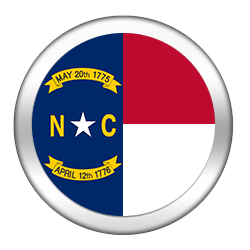 3 Is Online Poker Legal in North Carolina? The battle wages on regarding video-sweepstakes cafes and some are calling for tighter regulation, while others want a complete ban of the industry. As online access to gaming continues to grow globally, this is not a topic that is going to go away anytime soon. North Carolina lawmakers need to decide whether to strengthen their resolve against gaming in their state or do they give in and welcome into their state the revenues that are garnered by way of online poker and iGaming. According to North Carolina law, the only 100% legal way to play poker is to play at one of the tribal casinos. Any other form is considered illegal. It is even illegal to play poker for money in your own home. Although playing poker is deemed illegal outside of one of the tribal casinos, little has been done in the way of legal punishment, those who choose to play for real money online. It is recognized that any reputable offshore online poker organizations where citizens of other states can sign up with, so can North Carolinian poker players. North Carolina takes seriously its commitment to contain gambling to the one tribal casino in the state. While there are no specific laws on the books that address online poker or online gaming, it is considered to be games of chance and superficially covered by law. Operating an online casino within the borders of North Carolina has very serious legal ramifications. Playing online is quite a different story. Despite the illegal aspect of playing poker online, players are taking a liking to online poker. Thus far, little has been done to bring halt to online poker games. Many online iGaming will accept North Carolinians. Choosing the right online poker room for you is half the fun. Regulated gambling is pretty unlikely any time soon Considering North Carolina is one of the slowest to respond to the idea of a state run lottery. This is relatively ironic considering it had a very active one in its earlier days. Also taking into account that there is only one tribal casino in the entire state little has been done to increase regulated gaming in the state. The first English child born in America, Virginia Dare, was born in Roanoke, North Carolina, in 1587The first English child born in America, Virginia Dare, was born in Roanoke, North Carolina, in 1587. North Carolina’s crackdown on video poker makes it unfriendly territory as far as licensed online poker is concerned. The recent crackdown on sweepstake cafes and video-poker make the idea of gambling expansion pretty minimal. There is reluctance by lawmakers to expand gambling and enter in to regulated gambling statewide, especially in the area of online gaming. The likelihood of North Carolina expanding is not in the cards so it seems.